In Ardeche, Savoy … or close to your home. Aérodrome d’Aubenas Vals Lanas 07200 Aubenas Coordonnées GPS 44° 33’ 11 ‘’N 04° 22’ 19’’E. Valmeinier 73450 Coordonnées GPS : 45° 10’ 29 ‘’N 06° 29’ 33’’E. Lessons last 20 to 40 minutes. 15–20 hours of flying time will enable you to fly on your own and provide you with the necessary experience to manoeuvre, take off and land with a latest Air Creation Microlight. A warm welcome awaits you at our base situated at 2200m altitude in the ski resort of Valmeinier in the Savoy region of France. Using our Tanarg 912 micro lite which is specially equipped with snowboards, you will fly over valleys, mountain passes and land on snow covered slopes at different altitudes. Just tell us where and provided it is within an authorised zone with regard to aerial regulations we‘ll try and answer your requirements. 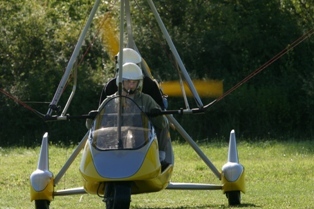 We are happy to provide a quote using our microlight or using your own, depending on our availability. For your 1st license, a medical is obiligatory. over 15 years of age. 40 question QCM, 6 false answers authorised. obtain authorisation to fly alone.